What is ‘Extreme’ Picky Eating? It’s a hot topic at the playground and preschool pick-up; parents commiserating over their child’s sudden refusal of long-time favorites, or yearning for all foods “beige”. There is a lot of talk and worry around picky (fussy, finicky, choosy…) eating. Then there is the mother not saying much, wishing if only she had a child who would eat macaroni and cheese, or cucumbers with Ranch while other parents complain about the ubiquitous white sauce. Then there are the few moms and dads in the bunch who enthuse that if you only knew how to crisp kale chips properly, all the children would surely love them like theirs do. These discussions mirror what research tells us about the experiences of parents of young children: various studies suggest that between one and two-thirds of parents will describe their young child as “picky” at some point. Most will grow out of it and expand their tastes, but about 10-15% of children will become “persistent” picky eaters and many in that group have what we call “extreme” picky eating. Researchers are still trying to agree upon consistent language and definitions. Clinicians and health insurers try to define ‘pathology’ that needs treatment and billing codes for reimbursement. Many of the labels and diagnoses we see include: feeding disorder, failure to thrive, infantile anorexia (outdated term), problem feeder, ARFID (avoidant restrictive food intake disorder), feeding aversion, selective eating, and selective eating disorder… Parents have also heard “spoiled”, or themselves been labeled as “neurotic”, “neglectful” or even “abusive” for letting their children eat foods not up to nutrition police standards. 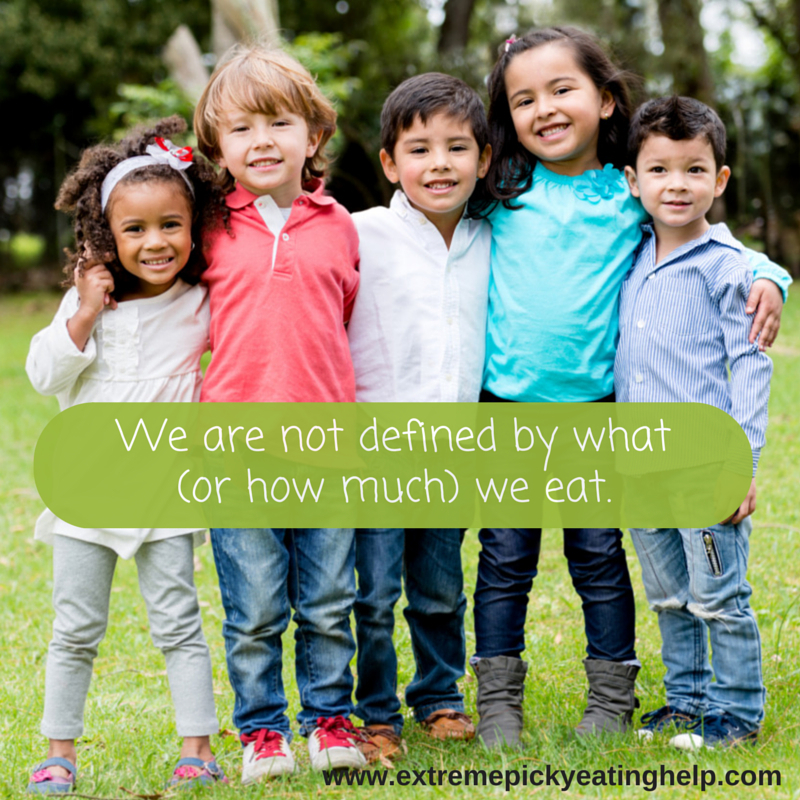 Regardless of any label or diagnosis your child may or may not have, we describe picky eating as extreme, “…if your child’s eating is affecting his social, emotional, or physical development and causing family conflict or worry…” Is he able to eat enough variety and amount to meet basic nutrition and growth needs? Does he get unusually upset around new foods and have difficulty calming himself? Has he always struggled eating solids? Does he avoid social situations where there may be new foods or pressure to eat? Is eating or not eating causing him, or you, anxiety that is getting in the way of your relationship, sleep, or ability to enjoy life? Do you spend a significant amount of energy and sanity points thinking about and enforcing ways to get your child to eat more in terms of amount of variety of foods? Typical: Your three year-old prefers white rice with the teriyaki/honey chicken and veggies. You made brown rice and she cries. You say, “I’m sorry you’re upset, but we’ll have white rice again soon. You don’t have to eat the brown rice and there is chicken and broccoli and peppers.” She calms with a hug and goes on to enjoy some chicken and a few pieces of broccoli. She used to eat it mixed together as a young toddler, but around two, she preferred the chicken and veggies separate. Extreme: Your child can smell the brown rice cooking and notes it is different. He’s never liked the stir-fry, and after several minutes of tense negotiations he agrees to try two grains of brown rice. He cries, sobs and gags before he has even tried it. After he eats one grain, he is allowed to have a dry toaster waffle. Extreme: Your preschooler only eats one brand of vanilla tube yogurt which has to be very cold. The only other foods he eats are McDonald’s chicken nuggets and Pirate’s Booty. You notice that his 13 month-old sister seems better able to chew and handle foods. Typical: Your child ate a variety of baby foods and family foods until about age 18 months, and then things went downhill. He is very verbal, draws you into negotiations and eats fewer and fewer foods, refusing to eat unless it is exactly what he wants and cut how he wants it. Extreme: Your then-infant had trouble nursing, and wasn’t interested in family foods. You began solids at 5 months on your doctor’s advice to try to help her gain weight. It has always been a lot of effort and battles have been frequent. She never mouthed objects, and doesn’t even like sweets now at 18 months. She is still on purees. We feel comfortable using the more inclusive word parents most often describe their child’s eating with and the resulting family dynamics— “extreme” (and “severe”). We don’t insist on always pinning down a label. Why? Because among other things, picky eating can exist on a continuum. Has the problem existed for a month, a week, a year? Is 21 accepted foods okay, but 20 is pathological? Because his reflux has resolved, but his fear continues. Because if you and your child are struggling, you need help, and while the factors that can contribute to the formation and persistence of a feeding problem vary, the resulting picture is quite similar from child to child. (Harris, Blissett, and Johnson 2000). Don’t get us wrong. Having an understanding of contributing factors and ruling out and treating medical or developmental issues is critical, but for many children, no clear diagnosis exists. You may not ever know exactly why your child reacts to food the way he does, why your first child ate all the home-made food you made, and the second just… didn’t. While hunting for a diagnosis, families can get more and more stuck and distracted when the tools to help are already available. Treasure and love and nurture your child, right now, whether he eats five foods by mouth, none yet, or thirty-five. As one mom said, “I don’t want what he does or doesn’t eat to define him.” So whether you choose to call it “extreme” picky eating, selective eating, ARFID, or nothing at all, know that you can support his eating, heal anxieties, strengthen your bond and make the family table a place the whole family can enjoy. Next post reviews the STEPS+ approach in our book and will begin to show you how.